The cooler temperatures are putting me in the mood for some deep cleaning! Last week I spent a couple days cleaning the barn, and this week it’s all about the house. To be exact, I am concentrating on my mattresses and carpet. 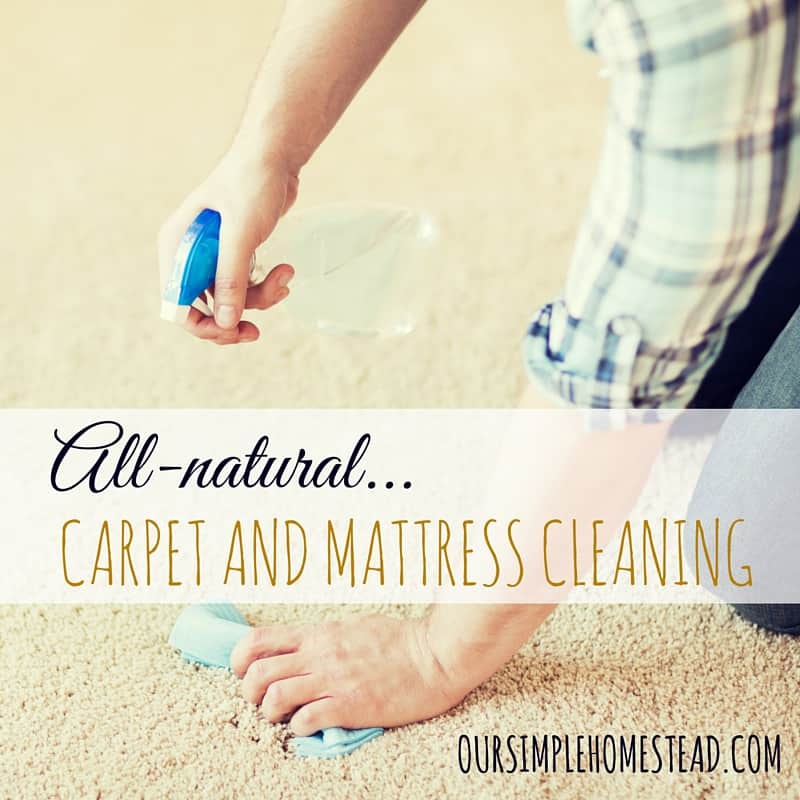 There are plenty of commercial carpet and mattress cleaners that promise to deal with all the unpleasant stains and dirt that has invaded my home, but I like to take matters into my own hands. There is a broad range of choices when it comes to cleaning products. However, not all of them demonstrate the effectiveness and all natural carpet and mattress cleaning solutions I like to use. Carpets should be cleaned on a regular basis as they tend to accumulate a lot of dirt and dust, especially here on the farm. As far as mattresses are concerned, a cleaning should be performed every 3 months. This way you will keep the mites away from the mattresses and you will remove any dust that may cause allergy to more sensitive people. It is possible to create a multifunctional carpet and mattress cleaner quickly and easily. Forget about the expensive cleaners that are filled with harmful chemicals. Mix the essential oil and and the baking soda and place them into a glass jar. Sprinkle on your carpet and let it stay for up to 10 minutes. Then vacuum the carpet in the usual way. The best part is that you can apply this recipe for mattress cleaning too. To remove any mites and dirt from your comfortable mattresses, sprinkle the powder on to the surface and leave it that way for 5 minutes, and then vacuum. When you apply this cleaner for mattress cleaning, make sure that you pick an essential oil that possesses a calming and relaxing scent, such as lavender. Mix all the ingredients and pour in a spray bottle. Applying this recipe is very easy – you only need to spray the stain that requires treatment and to leave it that way for about an hour. This DIY cleaner is suitable for removing a wide range of stains and hydrogen peroxide is particularly effective for removing blood stains. It is essential to clean your carpets and mattresses on a regular basis and to remove the debris and dirt that can quickly accumulate on their surfaces. Forget about the commercial cleaning products and try these innovative and easy DIY cleaners that are absolutely safe for you and your family. I finally have all the carpet removed from the house but to clean mattresses and upholstered furniture I have been using a mixture of water, vinegar and dish soap. I am not as happy with this solution and am going to try your recipe. I hope you like it…it works great for me when I tried it. I would worry that the hydrogen peroxide would bleach the carpet too? I have a beige carpet in my bedroom and I didn’t have any issues with bleaching in the spot I used this spot remover. I would test a small patch somewhere before treating a large spot where bleaching may occur.